TCMC have been awarded the state-issued "excellent exporter" prize for 20 consecutive years. From 1995 to 2001 TCMC has received Taiwan’s best company award from the state Department of Industry. Quality control is of paramount important to us. A sample is taken from each harvested batch of chlorella and mixed in a saline solution. From this, a culture is prepared to determine the presence of any bacterial growth. Computer-monitored measuring processes are then used to determine the chlorella's component profile. If a chlorella batch does not meet with the prescribed standards it is processed for sale as an animal feed ingredient. After the chlorophyll content has been measured and approved using a color spectro-photometer, the algae are finally examined under a microscope to ensure the absence of any impurities before the product is packaged for sale. Thorough analysis determines the biochemical composition and the microbiological components of the powder.Chlorella must conform with strict legal standards if it is to be sold for human consumption. Chlorella is often sold as powder. However, to create a product that is easy to take,we process some powder into tablet form. As these tablets are 100%-pure chlorella and contain no filler or binding agents whatsoever, this process can only be carried out if the powder is totally free of impurities. If a chlorella batch does not meet the standards set in the afore-mentioned tests, it is processed for sale as an animal feed ingredient. This is the warranty from our company to ensure the quality of TCMC produced Chlorella. By choosing Pure-Alga-Tech you may be assured that you are buying top quality Chlorella, the result of 39 years of experience in producing the ultimate natural health product. 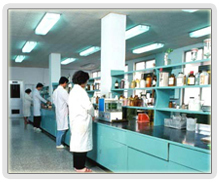 TCMC was established in 1964 and was the first company that started to grow Chlorella in Taiwan. Over the past 39 years, it has become the world's leading producer of Chlorella. TCMC is not just known for its largest amount of annual production (over 400 tons a year) but for its high standard of PURE quality. The market of the micro-alga Chlorella has developed from Japan to Taiwan and other 35 countries around the world. Since Chlorella has established its product awareness, many new producers have entered the market. As the result of this market expansion, many new producers have been established and compete in quality and prices. One consequence of this competition has been the appearance on the market of many other species of inferior quality. What can we GUARANTEE to our customers? TCMC guarantee to provide the best species of Chlorella to our Customers. The complete production process from selection of superior strains under the laboratory microscope, through outdoor cultivation in mineral-rich fresh water pools to final sterilization and cell-wall splitting of the harvested and dried algae is monitored by micro-biologists to ensure that the highest possible standard of hygiene and product quality is maintained at all times.